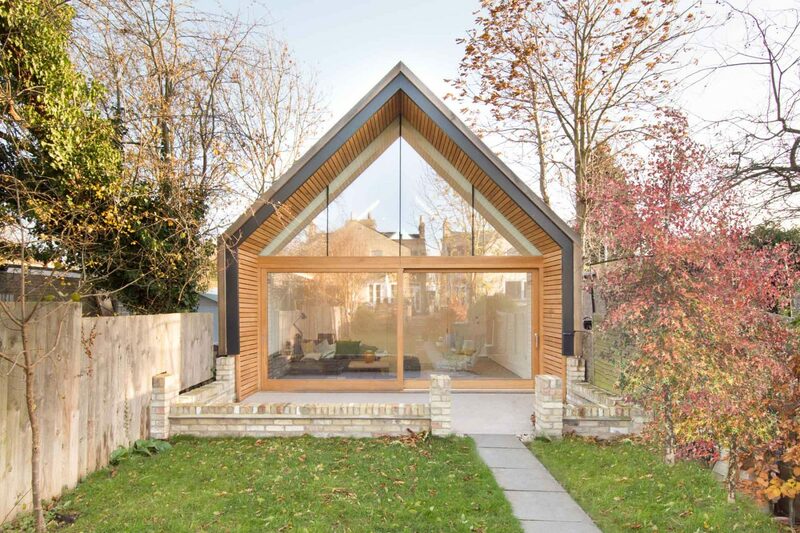 The brief for the building was to create a workshop and a garage at the end of a garden in the middle of Cambridge. 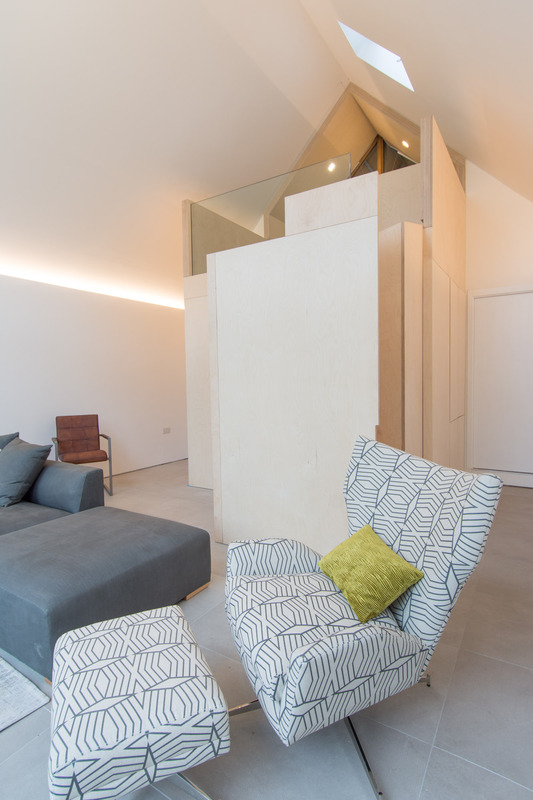 The client wanted to consider whether this offered an opportunity for an additional family room, a space to entertain, a place for guests and relatives to stay, a home office. The result is a clear demonstration that there was. 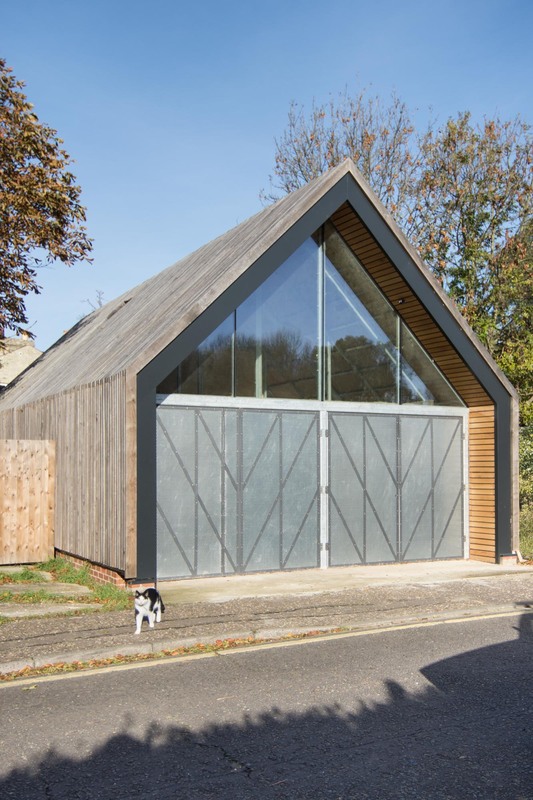 The building had to be conceived as a kit of parts that would enable the client, and friend, Joel, an engineering consultant with whom we have worked, to largely construct the building himself, with the help of his father and a group of willing helpers. As a result it has taken several years to come to fruition as daily life, new children, wet weekends and summer holidays could often put the project on hold. 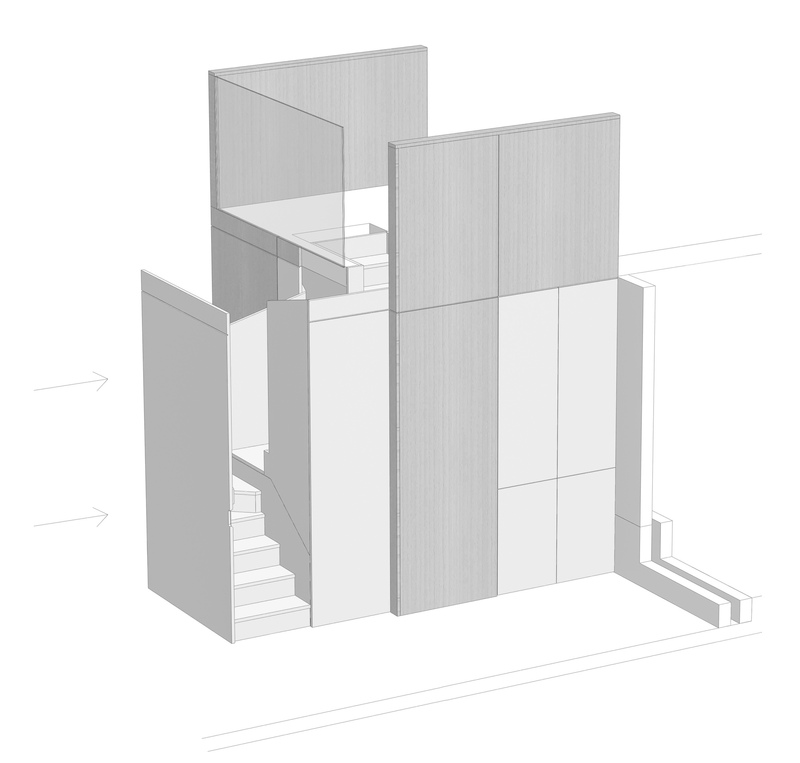 The building is separated into two halves along its length. 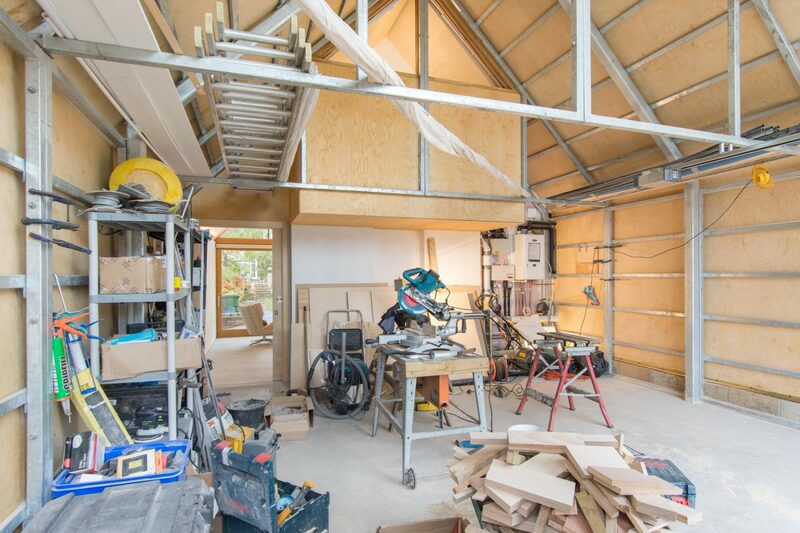 At the end of the building backing onto Mariner’s Way and the end of the garden, is the Garage/Workshop and at the opposite end, opening out into the long garden is the Family Room/Guest Space. The building is clad in a series of regular vertical oak portal frames that run continuously from one side to the other. They sit above the waterproofing and are supported only on the wall elements so that no penetrations through the roof are needed. The continuous cladding shrouds the gutter and gives the building a homogenous quality that gives no hint of the varied activities taking place within. 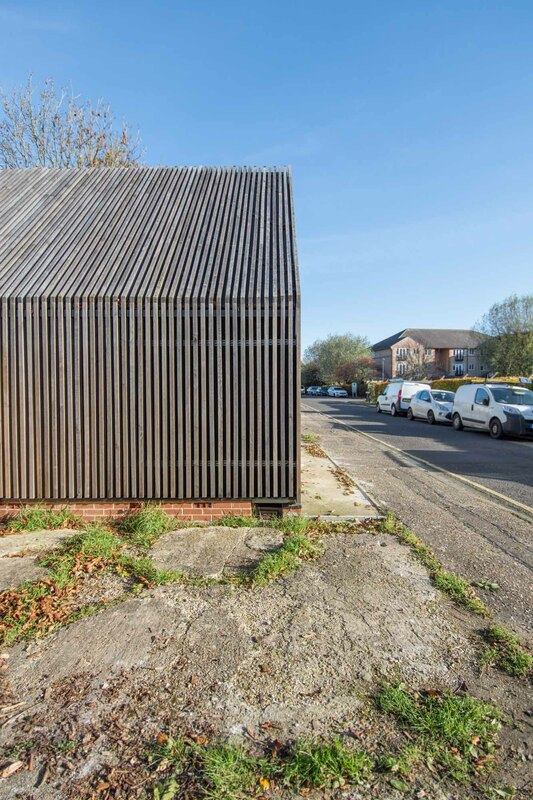 The length of the construction phase has given the untreated oak time to weather and enable the building to blend into the streetscape as one moves along Mariner’s Way. 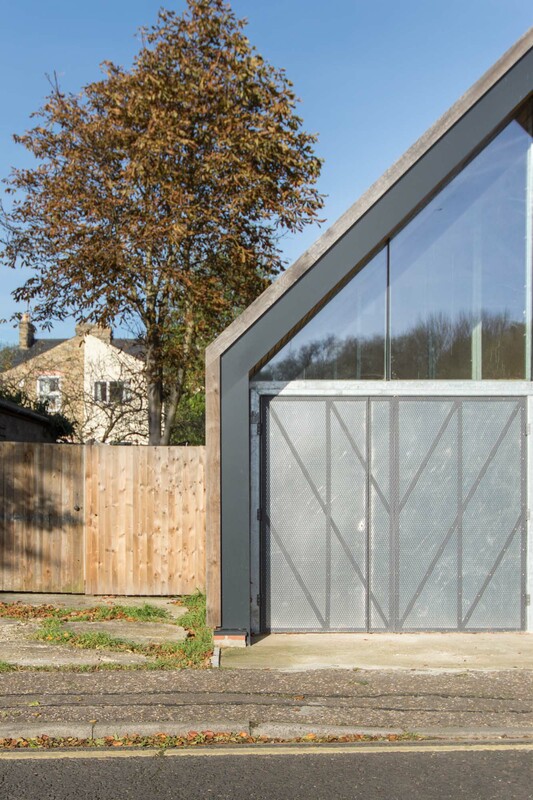 The high level glazing and textured steel doors provide the character to the rear elevation. 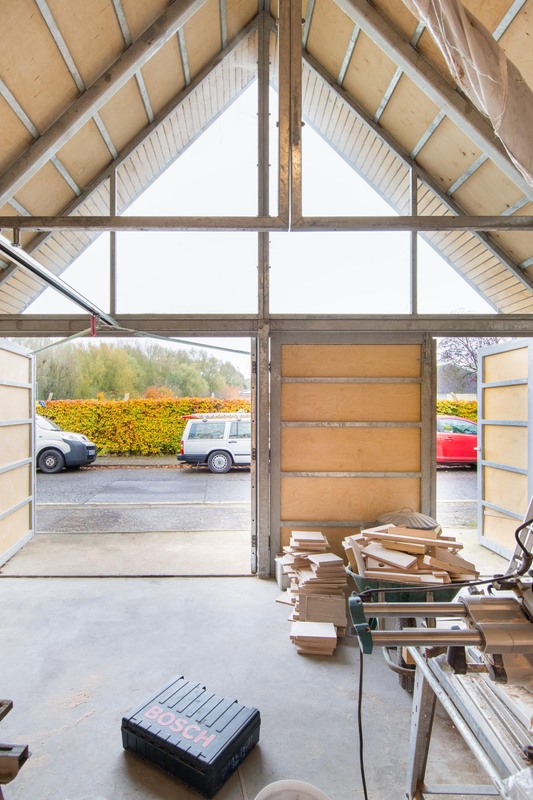 Inside the Garage / Workshop space, the building’s exposed steel frame consists of modular wall components, roof trusses, and battens made from 50mm galvanised Square Hollow Section, all of which were designed to enable the client to erect the frame himself. Outside this sits a structure of SIPs running the length of the building. 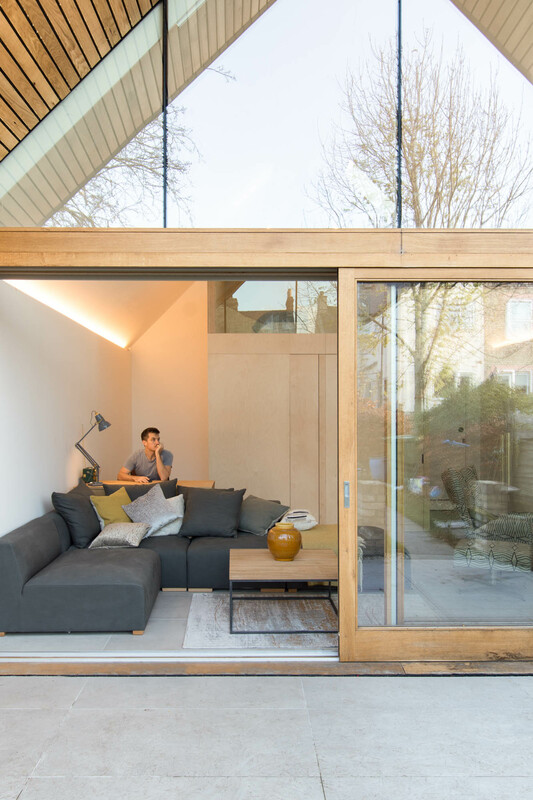 Designed around the manageable size of a sheet of plywood (i.e. 2440 x 1220mm), the SIPs dimensions minimised waste in manufacture and eased assembly by the client. 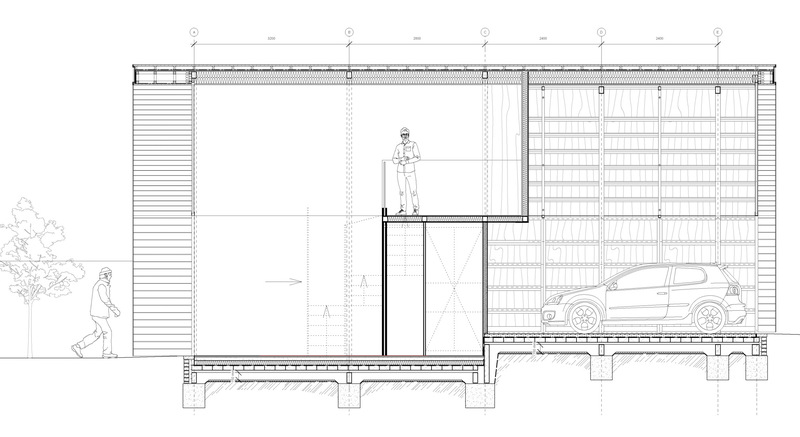 These dimensions informed and coordinated the spacing of the steel sub-frame. 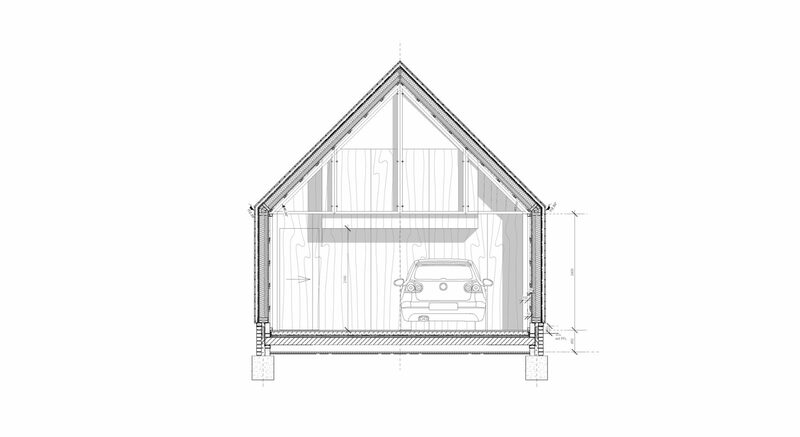 The result is a completely airtight and very well insulated structure with no thermal bridging, in keeping with the fabric first environmental approach. 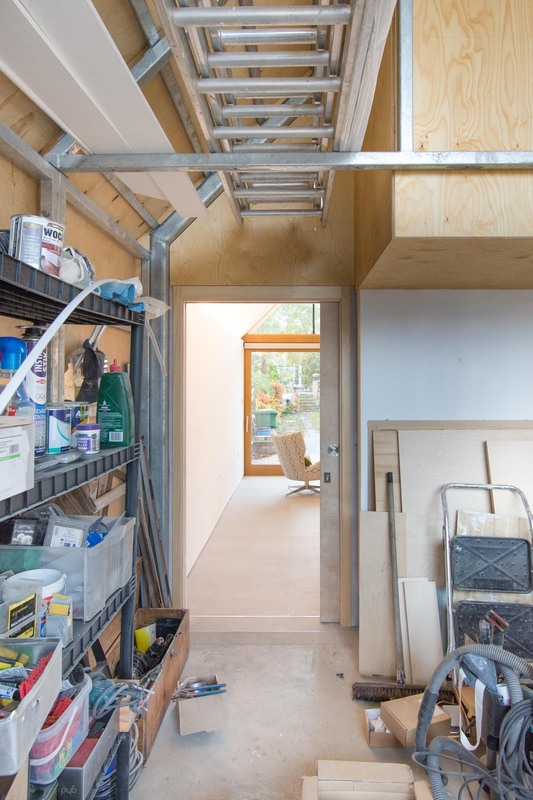 To the rear of the garage is a door that connects through to the living space. 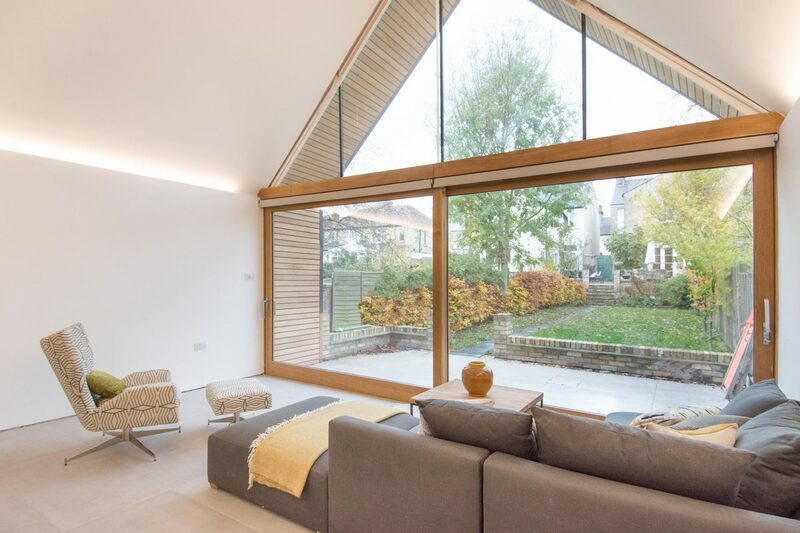 As it opens, one is confronted by a fully glazed elevation with oak sliding doors that looks back up the garden towards the main house. 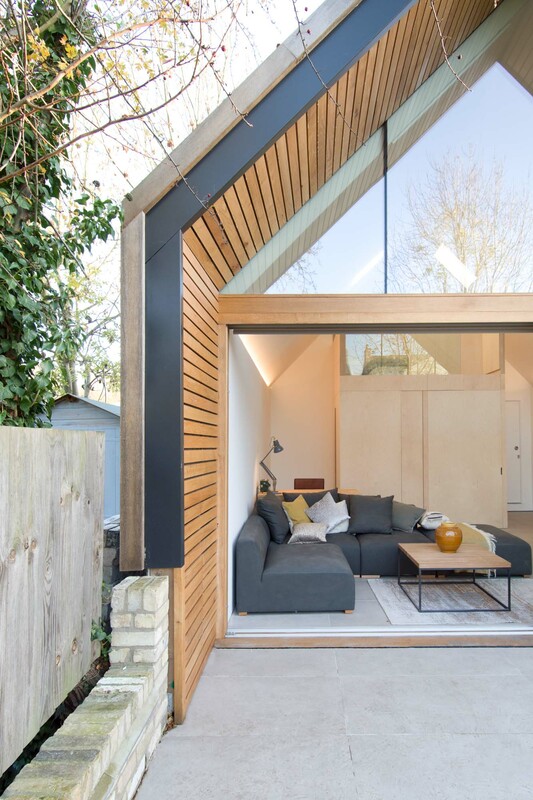 The glazing is carried by a discrete steel hanger that enables the oak structure to be kept slender, a triumph given the loads and desire to allow both doors to slide. 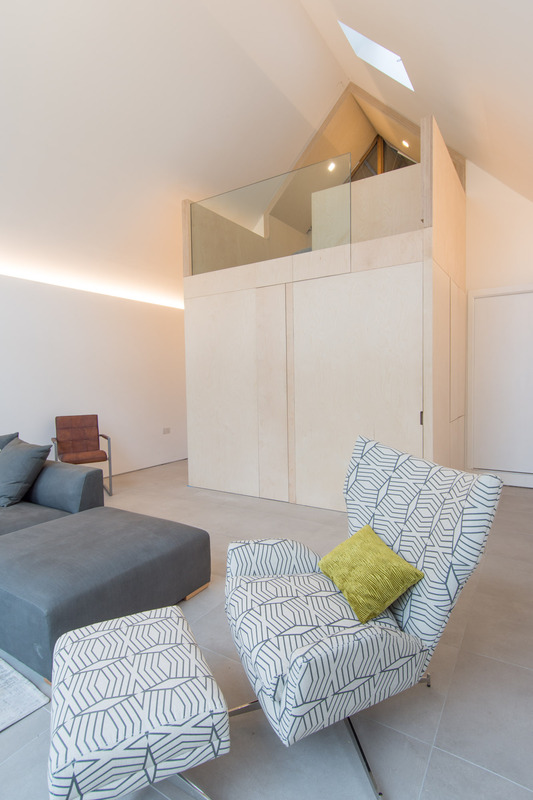 Inside the ‘Living’ space, straddling the party wall between garage and living is the ‘Box’. 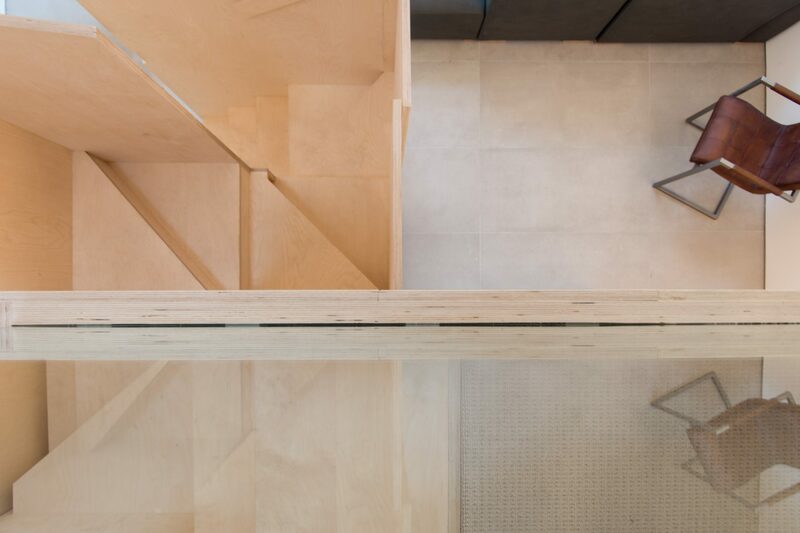 This large piece of CNC cut furniture, sits as a discreet, sheer walled element within the space, when closed, maximising the floorspace available to be utilised for varied activities. However, when required, it unfolds like a magician’s suitcase revealing a concertina staircase allowing access to the sleeping mezzanine over, a hidden bookcase, shower room and kitchenette. 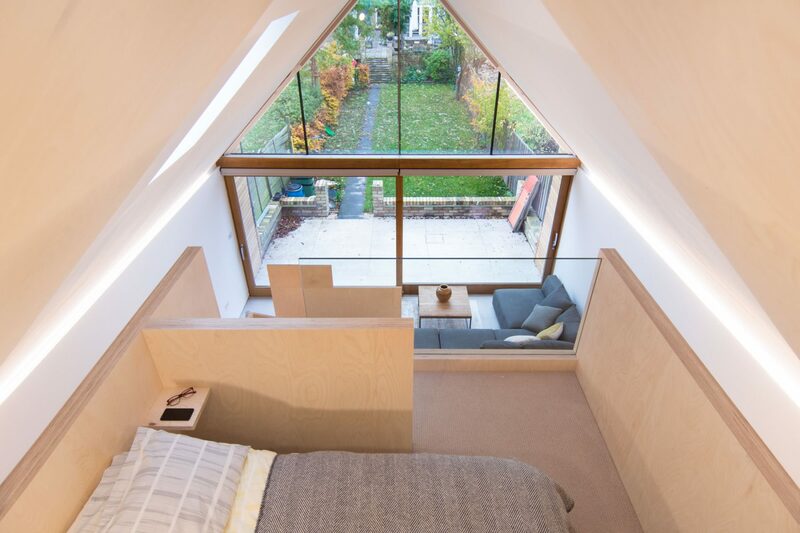 The success of this element enables each of the briefed functions – guest room, home office, family room, large dining – to be undertaken without encroaching on each other.